Seasonal color beds are landscaped flower beds, container groupings, or a single large container installed with annual flowers or foliage. Exterior holiday decorations such as Halloween blow-ups, Thanksgiving pumpkins, and Christmas lights also fall into the category of seasonal color installation. Typically two to three times a year, seasonal color installations are updated with seasonally appropriate bedding plants. In some landscape installations, perennials, shrubs, and specimen trees often share space with seasonal color. During change-outs, only the annuals are removed and updated, the other plant materials remain. 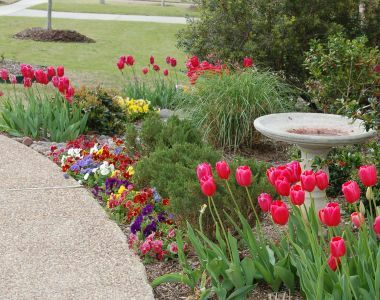 Color beds can be planted in either shade or full sun as long as site-specific plants are used. Styles, shapes, and color groupings of seasonal color beds are endless and only limited by you and your landscaper's imagination. 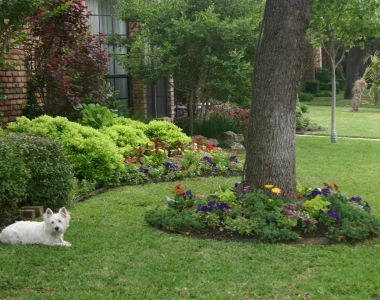 In North Texas, the following plants are commonly-used annuals in seasonal color installations: fall and winter annuals referred to as "Cool Season color" include Chrysanthemums, Marigolds, Dianthus, Pansies, Violas, Alyssum, Cyclamen, Phlox, Stock, Snapdragons, Sweet Pea, Kale, Larkspur, Delphinium, and California Poppies. Spring and summer annuals referred to as "Warm Season color" include Petunias, African Daisies, Calibrochoa, Geraniums, Begonias, Impatiens, Periwinkles, Pentas, Salvias, Sweet Potato Vine, Lantana, Celosia, Verbena, Caladiums, and Coleus. Pricing for seasonal color will vary depending on how often it is updated, area coverage, size of bedding plants, and plant selection. Smaller installations start around $50-100 while larger and/or multiple seasonal color installations may be several hundred dollars to thousands of dollars. Browse books, magazines, and YardHookup.com landscaper project portfolios for seasonal color bed ideas. Are dead or diseased plants replaced free of charge by the contractor? What kinds of warranties are available for the installation? What is the change-out schedule? What is the maintenance and irrigation schedule for your new seasonal color installation? Request and check all references.